Five Horse Johnson aren't sorry for the mess they made. After all, it comes with the territory of being a badass rock band from Toledo, OH with five discs under its belt and countless drunken anecdotes to share. 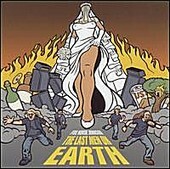 The Last Men on Earth, the quartet's latest offering, blends the stomp of early ZZ Top with the runaway blues-rock of Rocks-era Aerosmith, creating an acidic flashback of the way rock used to be. Heavy rhythms and whiskey soaked vocals shine on "Cherry Red", while the raucous boogie of "Blood Don't Pay" reaffirms that it's OK to wear those bell-bottoms and butterfly collared shirt together. While some may consider The Last Men on Earth a tired retread, those in the know share the sentiment that bands like these are here to reignite the emotions that rock music lost when the world got politically correct. Going from the confines of the swamp to the strip mall isn't an easy transition to make, but the solid grooves Five Horse Johnson lays down make the change both easy and welcomed. Grab a cold one and a pool cue and crank this one up, folks.